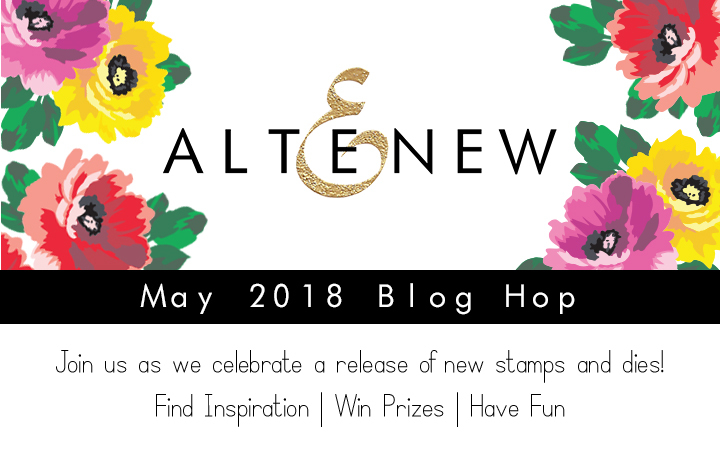 Yay, it's May release Blog Hop from Altenew! I am excited to share some projects with you today. If you arrive from the talented Paige Evans, you are in the right place! If not, please come and join the fun hop! All the details about this blog hop can be found in Altenew's Card Blog and Scrapbook Blog. You can see the entire May release collection here. My three projects feature all about flowers. After all, it is May, right? First up, it is a very cool, trendy and lovely set called "Botanical YOU". I inked up the bright pink and orange color in Razzleberry and Orange Cream. I followed the instruction guide which makes it easy to do. Love this simple multi-step stamping. The one step I did differently is that I embossed the last layer in Rose Gold. Not only this gives fine subtle textures, it also adds a lovely shimmer! I stamped the images on watercolor paper and highlighted the black with all the flower center. Since it is a thinking-of-you card, I thought a touch of black fits the theme more aptly. I actually painted the flowers with Altenew ink for the watercoloring. It really worked beautifully! The matching dies make it an easy task to frame the images. If you love seeing Starry Flower Stamp/Die, I have MORE to share in the next few days! My 3rd (last) card was created with lots of love (and colors!). Introducing.... Garden Silhouette and Rustic Linen (background stamp). This card is a bit more complex and has a few extra elements. However, it surely was so fun and satisfactory to create. Technically, there are two parts to this design: stamping Garden Silhouette (on paper) and embossing "Rustic Linen" ( with vellum). I stamped a bouquet of flowers one flower at a time and envisioned how my bouquet as I stamped. The vase/glass jar was embossed in Antique Silver. 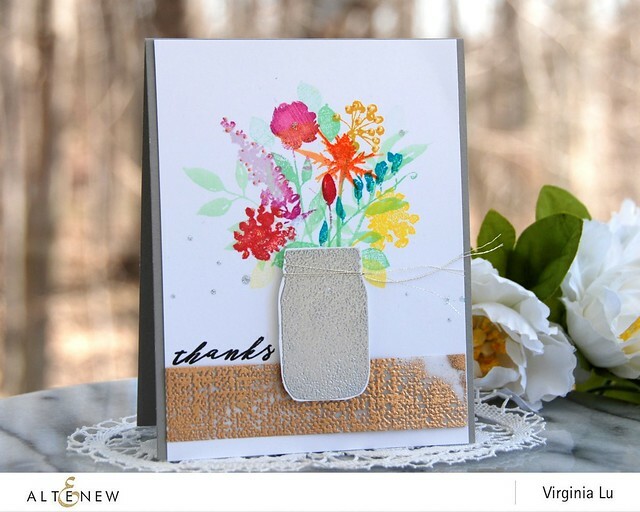 The new background stamp "Rustic Linen"
is a must! I embossed it on vellum with Antique Gold. I don't have a green thumb in my garden, but apparently I do with my flowers and bouquet on my cards! I hope that my projects bring you a SMILE! winners! Please leave a comment on the Altenew Card Blog and/or Altenew Scrapbook Blog by May 26th for a chance to win. 6 winners will be announced on the Altenew blogs on 5/27/2018. Giveaway: One of you who comment in this blog post will receive a $30 Gift Certificate! The winner will be announced right here in this post on Thursday, May 24th. 👉👉Do you have a favorite from my post? DO share with me in your comment and you will have a chance to win $30 Altenew gift Certificate! Your next stop is Simon Says Stamp Blog! What a lovely release. I think among the products in this release, it is the Botanical You that caught my eye. Thank you for featuring it in one of your cards. Makes me love this product some more.-Maria Giselle B.
Lovely cards... I really love the second card with its abundance of blooms! 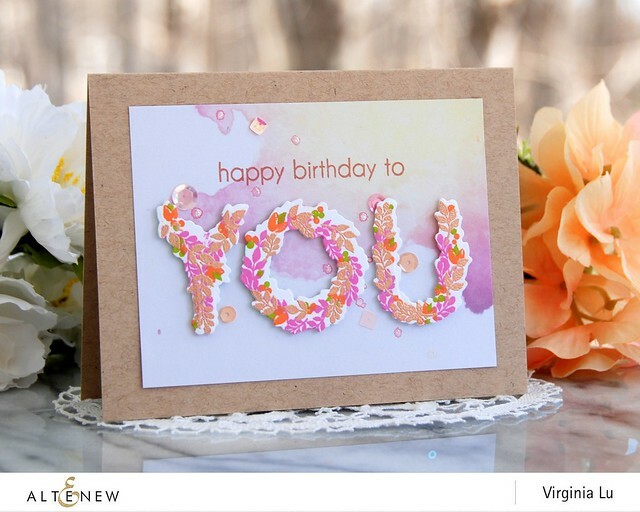 Gorgeous cards, Virginia - love them all but my fave is the YOU with the wash of color behind! Looks like a wonderful release with so many beautiful flowers but I can't wait to get my hands on the rustic linen background - love it!! LOVE your cards! 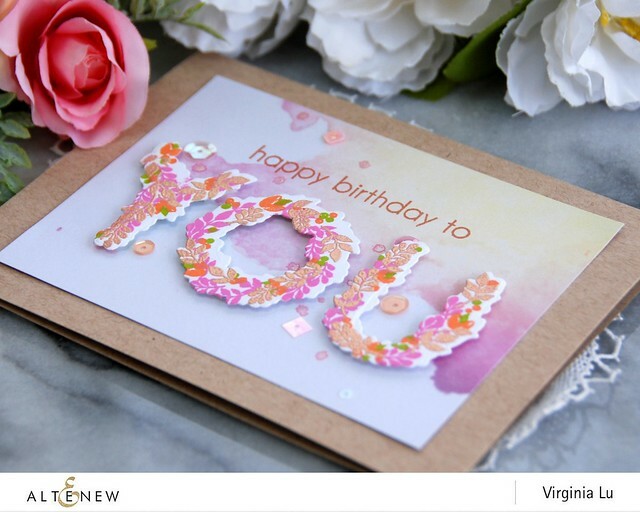 Using the linen background stamp as an element on the card instead of a background is so creative and it is so beautiful with it embossed on vellum. The flowers in the jar is so whimsical! On the second card....I love that you stamped the flowers on the back and then popped up the colored ones over. I really like all three cards, but if I have to choose a favourite then it’s the Starry Flower card. It’s just so different. Thank you for sharing your creations. Looks, to me, as if your green thumb is a bright shade of emerald when it comes to making cards. Each card is lovely and unique. Love your color choices on the floral letters. Think those starry flowers look amazing both stamped directly and popped up on you card base. The last card is so vibrant and happy...the embossing with the linen background looks incredible on vellum. And, as usual, your Virginia touches are just plain brilliant. Beautiful cards! I love the YOU stamps! Beautiful cards, the vellum embossing looks amazing! fantastic release from Altenew. Great examples of cards for different occasions. Love all of your cards but the second one is my favorite!! So gorgeous!! You did a fabulous job! Really pretty cards! Thanks for all the inspiration! Very pretty cards you made with this release. Your cards are all so pretty, Virginia! Love the second one best!! Such beautiful cards. The colors you created with are so elegant!! Beautiful cards! I love all of the soft colors of your flowers. The linen stamp is one of my favorites and it looks lovely embossed on vellum! Gorgeous floral projects--you DO have a green thumb! I'm smitten with the first card and now I have to add that to my wish list! Thanks for enabling! I really love the garden silhouette card and appreciate your inspiration with how you popped up the jar and the linen piece. love the new release! Your cards absolutely do make me smile. Just perfectly lovely, and you do grow lovely stamped flowers, even if you can't grow the real kind! Love the silhouette card, to is so airy and dreamy feeling! Rustic Linen Stamp Set embossed is so clever! I loved that card! I always find so much inspiration in all your work...its colorful and pretty. 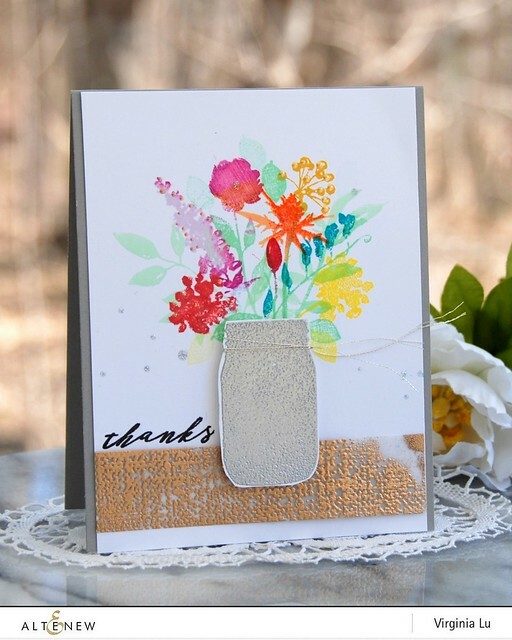 I love the starry flower card, and also that you embossed that jar in silver...brilliant detail! I agree - I think the starry flowers set is the best of this release, although there are lots of other fantastic items in this release. love your cards. Thank you. Your cards are lovely! The embossed layer in the Botanical You is fabulous! I would have never thought to do that. Thank you for the great inspiration! A-Mazing!!!! Love the stamps you chose to showcase today because they are ones I had wanted in the peaks! Botanical YOU is so sweet with your color choices of rose gold hints throughout! Love the Rustic Linen and how you used it on the vellum! I agree this is a must have stamp! Love how you watercolored the Starry flowers and can't wait to see your upcoming samples!! Great inspiration and textures in all of three cards! Am going to have a hard time not buying all of them!!!!! I absolutely love your cards, they are so pretty! The gold embossing on the vellum using the Rustic Linen stamp really came out beautiful. Love all your designs. beautiful cards!!! I really like your birthday card! so pretty! they are all lovely but i love that sympathy card the most! Your cards are just so beautiful!! Beautiful choices for beautiful cards. Thanks for sharing. Love your cards. Very pretty. Thanks for the awesome inspiration! I am in love with how bright and colorful the last card is! Wow I so enjoy seeing your lovely creations Virginia!! They all so captivating!! Three spectacular cards............my favorite --too hard to single one out....ok my favorite is card #2 followed by Card #3. Wonderful!!! Virginia, all your cards are beautiful. I think my favorite is the botanical YOU card. Thanks for sharing. Beautiful You. Love your color scheme. Gorgeous! Botanical you is stunning!! 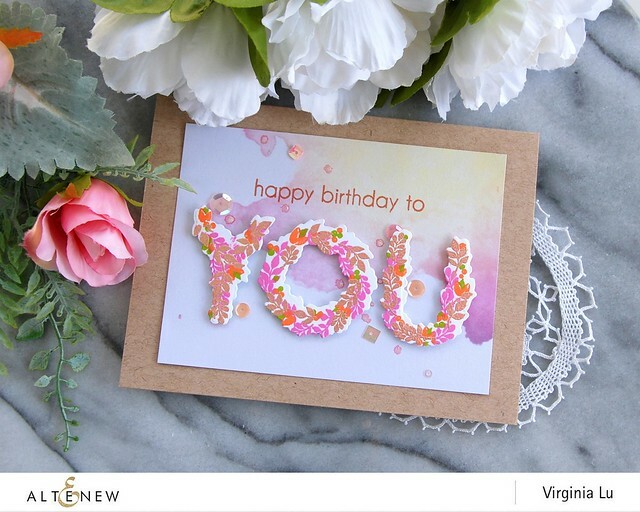 I love the soft colors and layout of your Thinking of You card. Your floral bouquet is so pretty! Fantastic cards Virginia! Such gorgeous color combinations and I LOVE the Rustic Linen embossed on the vellum. I love them all, last one is my favorite. Beautiful work! lovely cards! I like the way you used the floral as a background image and the main image as well! Love the look of the embossed linen. Actually, I was very impressed with them all. The You stamps will have many uses. My favorite card is the one using the Starry Flower set. It makes such a sweet feminine card. But I must add how much I like the gold vellum embossing with the Rustic Linen stamp. That is texture!!! I love the card where you can see the flowers behind the dimensional flowers. This is a great release. lovely cards, Virginia - the second one is especially pretty! Beautiful cards Virginia. Love the new floral images. The starry flowers are so pretty! Also love the gorgeous silhouette wild flowers. Beautiful cards as always, I loved how you popped up the Starry Flowers - such a great look! I rand really like your card with the mason jar and flower, so pretty. These are so pretty! My favorite is the second. I am in love with your placement of the florals and the bit of black, just so lovely! Oh, there are so many wonderful ideas and techniques tucked into these beautiful cards I love this release! I love the one card where you stamped the floral outline as the background then foam mounted more flowers in front! Stunning! Yes, Virginia, your cards definitely brought a smile to my face! They are simply gorgeous!! I think your Starry Flowers card is my favorite. I really love the colors you used on the flowers and the way you grouped them makes them look so pretty!! Your cards are amazing. The colors on the florals are just beautiful. I love the wash in the first card! Love the pinks and oranges! Love the Starry Flower card. Also like the embossed piece of vellum-- really like the new Rustic Linen stamp! Hi Virginia, Love your cards but my favourite is the water coloured one, TFS, Cheers Anna. All nice cards but if I have to pick one.. I like the You card because you used some interesting colors! Such beautiful cards! I really love that Garden Silhouette set.... have to have it! Beautiful cards Virginia! I love them all especially the glittery vase with the beautiful flowers. Your cards are wonderful but the starry skys card captured my heart. I love that stamp sset. I HAD to see all of the inspiration with these amazing NEW products!! So great to have taken part as a guest with you on this Release! I love the Garden Silhouette set, you did an amazing job with that set. Very pretty cards, great sentiment on the first floral card! Love that rustic linen and all the flowers. Beautiful card! I, too, love that starry flower stamp set. Absolutely gorgeous cards. Love the second one. Love the soft colors and oh, my Starry Flowers is wonderful! The black really sets it off too. Your cards are pretty and fun! What a lovely garden you have after all! Lovely! Each one is very lovely in there own way. You knocked it out of the park with your three cards! Beautiful! My favorite is the starry flowers card. I didn't think I was going to need that stamp set, but I was wrong. It's wonderful! The cards are all so different and all so very lovely! Thanks for sharing! Gorgeous colors and watercolor technique! Beautiful designs. Love the gold embossed vellum under your jar of flowers. Beautiful cards, the first is my favorite. Great idea to emboss in Rose Gold! Beautiful cards. I love how you used a small piece from the linen background stamp to ground your jar. Very clever use of this stamp. The "YOU" stamp is one of my favorites from this release and I love the colors you used. Thanks for sharing! 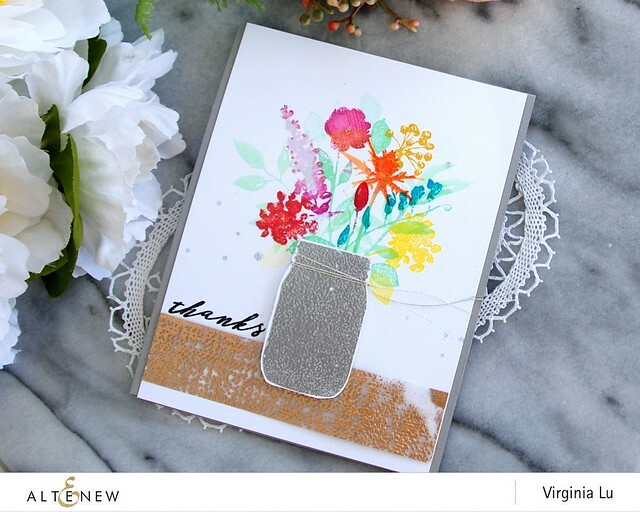 Lovely cards Virginia, the background paper is so pretty with the Botanical YOU stamp set. I also love the card using the Garden Silhouette set. Lovely indeed. Virginia, all three cards are simply beautiful! And, now I need to add the Starry Flowers stamps and dies to my wish list!! I love the addition of the rose gold embossing -- unexpected and lovely. Ooo, I hadn't considered using the rustic linen stamp on vellum, especially with metallic embossing, but I love how that looks! Actually, I love all your work; you have such a fun sense of style that's always different than how I would think about a product, and I really appreciate that. Thanks for sharing your lovely ideas with us! I love all of your cards. They are so pleasing to the eyes. Altenew did it again with the florals. My favorite stamp would have to be the Starry Flowers. This is a fabulous release. Great job! All are beautiful! Love the gold embossing on vellum with the Rustic Linen stamp. I agree... it's a must have!!!! Love your cards - my fave is the Starry flowers card. This is another fabulous release with some unique florals and more spectacular layering stamps again. Love the thin alphabet dies as well. Thanks for the beautiful inspiration! I love all your cards, but the starry flowers one is my favourite. These are so gorgeous, Virginia! I love the bright color palette! It really feels so fresh and ready for spring! The starry flowers set is my favorite in the release also. It's scale is just right and the simplicity makes it useful in many ways. I really admire the elegant way you used it in the encouragement card. Beautiful array of flowered cards!! Love the new starry night stamp and die set. Beautiful card. Beautiful cards, they always bring a smile to my face. LOVE all the techniques you shared in this post too, the rustic linen on vellum and the starry flowers popped up really caught my eye. All your cards are beautiful! I especially like the colours you used for Botanical YOU and how you embossed the last layer. These cards are absolutely gorgeous! Love those Starry Flowers! A must have for me! Simply wonderful cards showcasing the new stamps & dies beautifully. Gorgeous! I wasn't really sold on the Botanical You until I saw your color choices! I love all 3 of the cards you made. I adore your work so inspiring! I like how you used the linen stamp. Very creative. All three cards are gorgeous, and I'm particular loving the one using my favorite from this release -- Starry Flowers. Amazing. Virginia, all your cards are so pretty. I especially love the card with the mason jar and the soft watercolor flowers. This is a real beauty! So beautiful. I love what you did with the layering on the vase of flowers. Beautiful cards! Love all the designs! Virginia, all of your cards are wonderful and I like how in your first card, your background is only on part of the back; it catches your eye and then the YOU is not perfectly cut out (as you mentioned) but it works! And it shows us that even experienced card makers like yourself, can still make a not so ideal craft creation WORK. Whether it was a mistake or not, it is beautiful and brings the card together perfectly! I love the brightness of your mason jar card and the starry flowers card softness (the starry flowers for some reason, remind me of my parents azalea bushes growing up). Not sure why but I associate them with fond memories. Thanks for sharing! Gorgeous cards. Love your florals! Wow! I love the Rustic Linen in gold on the vellum. Your cards are simply beautiful. I love the soft pinks in your flowers. Thanks Virginia and thanks Altenew! wonderful cards..love the thinking of you card them most because of the dimension and colour. The Garden Silhouette is beautiful and my favorite, as are your other cards too! love them all. A Dramatic Take with Starry Flowers! Simon Says Stamp New Release!